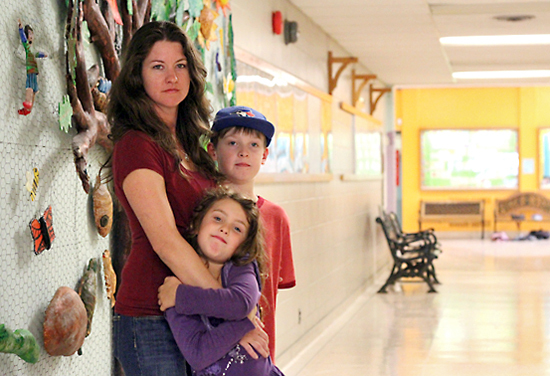 Heather Tormey stands with her son Eagan and daughter Neira inside Secord Public School on Sept. 6. A three-year effort by parents and others to have additional classrooms built at Secord stalled last fall when the province froze the capital funding budget of the Toronto District School Board. Walking the hall in the 20 year-old “port-a-pak” at Secord Public School, concerned parent Heather Tormey points to the peeling baseboards and strip of loose flooring that are new this school year. Never mind that the 14 connected portables where Secord students in Grades 2 to 5 go to class have dry air, or get too hot, or too cold, or feel cramped inside or look drab from the street. They are also a sign of a bigger problem. Secord and four nearby public schools are all struggling with student numbers. Sheila Cary-Meagher, Ward 16 trustee for the Toronto District School Board, says that taken together, the five schools have about 1,000 students who go to class in portables. Crescent Town Elementary has added new classrooms twice in the last 10 years, she said, but it has no more room to expand. Crescent Town used to have students from kindergarten to Grade 6, but first the Grade 5 and now the Grade 4 classes were moved to George Webster Elementary for lack of space. By the end of this school year, Cary-Meagher said George Webster may have up to 37 portables. Meanwhile, Parkside Public School and DA Morrison Middle School have the opposite problem – too few students. DA Morrison started this school year with six fewer staff than the last. Last April, a review committee made up of parents, teachers and school board members at the five schools recommended a plan to solve the problem – it calls for new classes at George Webster, closing Parkside and expanding Secord and DA Morrison so they have students from kindergarten to Grade 8. But after cost-overruns at Nelson Mandela and other schools elsewhere in Toronto, the provincial government froze $70 million in TDSB capital funding last year. The freeze was lifted in July, but Cary-Meagher says the situation is still more like slush than a full thaw. So far, she said, it seems the only money available is to add classes for 500 students at George Webster. But Tormey said new classes at George Webster will not help the situation at Secord. Tormey, former co-chair of the Secord parent council, said all of this planning was easier three years ago, before next year’s deadline for full-day kindergarten across the TDSB added more need for new classrooms. “This half-step process is frustrating. We now need to go after the TDSB to approve the plan so we can go after the province to release funds and make this right,” she said.